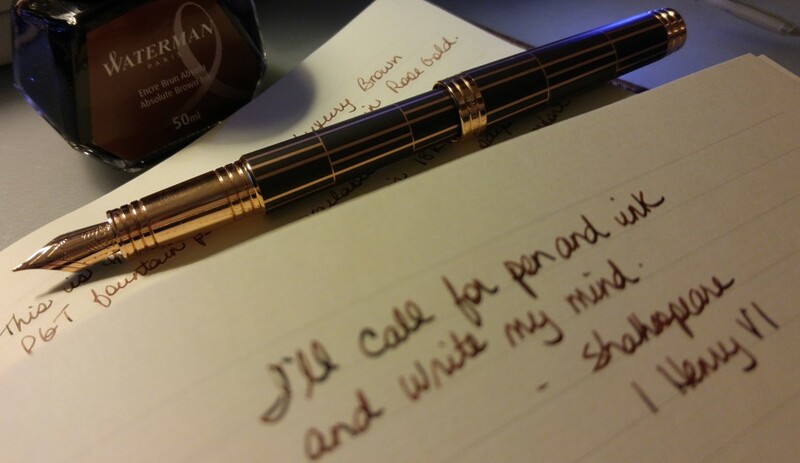 I was reading this article on Tiger Pens and I love the line: Who says writing by hand is worthless? Who indeed. Those autograph scams can be nasty. 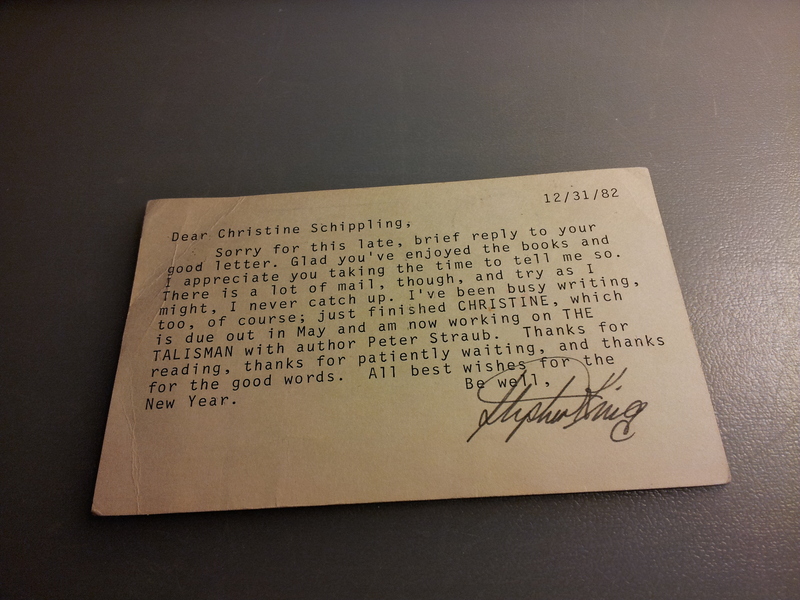 I have a card that appears to be signed by Stephen King. A friend of mine picked up a copy of Desperation at a free book exchange for me; he knew I liked Stephen King but had no idea the card was inside. I looked up his autograph and currently (if it’s real) it could be worth $100. He’s one of my fave authors and I just love having it in my collection. It’s obviously machine typed, and I like how he capitalized the titles of his works. Christine was indeed published in 1983; April 29th to be exact. And The Talisman was published on Nov 8th of the following year. So the timeline fits. I imagine him walking to the mailbox and dropping this off on a wintry Maine New Year’s Eve. Although I guess by 1982 he might have had an assistant to do stuff like that for him. Even if it turns out to be a fake signature I consider this a treasure. 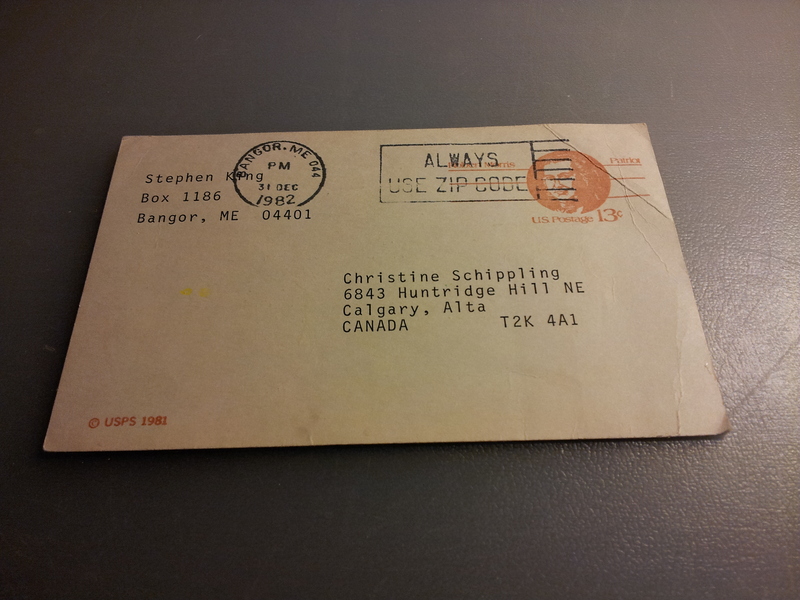 I was 12 in 1982; I was not living in Calgary then and do not know Christine Schippling. I wonder if she remembers receiving this in the mail – how thrilling for her to think that Stephen King just finished writing a book that shared her name! Hi. Sorry to say this, but most fan requests to a writer/musician/artist of his caliber, are handled through their publishers, publicists or record labels… even, as far back as the middle 1980s. Well, I was a little misleading. Likely, he signed it. At least, that’s how it works around here. Heh! Cool! That gives me hope! It’s real. I have one of those signed postcards, as I wrote to him back in 1983. Sorry James not at this time.